UST’s celebration of its 400 years is a good time for me to write about UST. I have not thought about UST for a long time, my memories of my brief time there buried in my unconscious along with all the other unwanted memories of my youth. I spent only six years of my life within its grounds, one year in kindergarten, four years in high school and one year in the Faculty of Arts and Letters. But UST’s grand celebration of its 400 years pushed memories of UST to my present consciousness. With a 400-year history, UST definitely played a pivotal role in the lives of millions of people. For me and my family, it played a huge role in our lives. My family (my parents and seven children) lived at the edge of the university and for about 17 years, our lives were inextricably woven with this great institution. Memories of UST inevitably bring memories of my family, Gov. Forbes and martial law. The youngest in a family of seven, I am the only one not purely UST-bred. The rest of my siblings were all schooled in UST from elementary until college. I do not know why my mother transferred me to the neighboring Dominican School after kindergarten in UST. In any case, it was still a Dominican environment, run by sisters. I returned to the UST fold in high school. My parents enjoyed the privilege of getting discounts for enrolling several children in UST which helped a lot in reducing expenses of the family during the ‘50s until the ‘70s. Having three children who were at the top of their classes also helped a lot since UST granted scholarships to those who got honors. Unfortunately, I was not one of the three. My brother Ramon and sisters Rosalinda and Remedios were the topnotchers in their classes. I “only” got honor awards in elementary and high school. Certainly the values of the Dominican religious permeated our whole household through the efforts of our mother who was both a religious person and a disciplinarian. We were expected to measure up to the highest standards of excellence. Being the youngest in the brood, I had the added pressure of being compared to all my siblings in UST since my teachers and school administrators would of course know them before they would know me. To them, I would always be the sister of Ruben, Ramon, Rene, Rosalinda, Ronaldo and Remedios. I was also the daughter of Mrs. Remedios M. Galang who was well known among the Dominican friars as a leader in the UST Parish’s Catholic Women’s League and as a proud mama pinning medals on her children. UST was an integral part of our family’s lives as we spent most our waking time on its grounds. It was easy for us to walk to and from our classes since our house was just across the campus being on Gov. Forbes St. (now known as A. Lacson) near the corner of Dapitan St.
Our house was a simple two-story white building with a maroon roof and four bedrooms on the second floor and a spacious living room, dining room and kitchen on the ground floor. Inside, we had shiny floors and narra walls. We rented it from the owners who lived at the corner of the block. Our house was one of six houses that were built exactly the same way, three of which were on Gov. Forbes St. and the other three on Dapitan St. I loved that house and I used to spend rainy days on our porch just watching the few cars that passed by (there were not many cars on the road then) or reading a book. In summer, from the kitchen door, I would watch the sunshine-touched trees on the sidewalk, feel the warm breeze and inhale the fresh air (no air pollution then). That house served as a home for our large family as well as a motley assortment of boarders who studied in UST (mostly medical students). Since it was conveniently located near the school, it also served as a place where we played with our classmates when we were younger or held parties and all sorts of get-togethers as we grew older. Because of this, our friends got to know the other family members as well. Every two (or three years), someone from our family would graduate and move on to the work world. The eldest, Ruben Jr. became a doctor; Ramon, an Electronics Engineer, worked in a manufacturing facility; Rene, a Mechanical Engineer, worked in a garments company; Rosalinda was a journalist in the Manila Times; and Ronaldo, an Electrical Engineer, worked in PLDT. 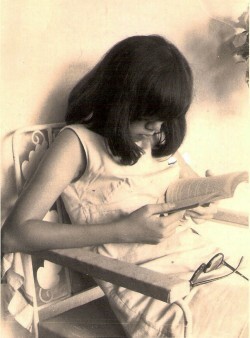 Finally in 1972, there were only two of us who remained studying in UST. My sister Remedios was in the College of Science on her fourth year while I was on my second year in the Faculty of Arts and Letters. I was one proud student having been in the top three of the Dean’s List for two semesters the previous year, the champion of the Inter-Year Debating Contest (we beat the seniors) and the winner of the Essay-Writing Contest. I also bagged the honor of being selected as a writer for the prestigious Varsitarian. Outside this “safe world,” the country was shuddering from a storm of political events. The political whirlwind shattered my world when one night, my family was awakened by men banging on our door. The military had come to arrest my sister Rosalinda, better known as Roz by her media colleagues and friends. She was on the list of media people tagged as “subversive” by the Marcos dictatorship. Martial law was in effect, but it was not yet known to the public then. Enveloped by fear, I crept down the stairs and saw a group of men in military uniform talking with my father in our living room. The arresting officers talked to him in quiet courteous tones perhaps out of respect for him as a retired colonel doing business with the Armed Forces of the Philippines. They told him they had come to arrest my sister. Apparently, my father got some assurances, for my sister was told to dress up and go with the arresting officers. My father would go to the camp the following morning. The following school day, I went from room to room with the other officers of the Artlets Student Council telling the students that martial law had been declared and that we had to resist it. The school administrator promptly reported this to my mother who was already distraught with the arrest of my sister. This triggered an unfortunate series of events that led to the end of my promising student life in Artlets on my second year. However, I was not kicked out of Artlets; I kicked myself out. What happened next, is of course, another story. Note: Inaccuracies in this blog, if any, are entirely due to lapses in memory.